Protocinema screens The Atelier, 2018, by Hasan Özgür Top at Depo,which premiered in an exhibition at Proyecto AMIL, Lima, and was commissioned by Protocinema with support by SAHA, Istanbul. Filmed in Turkey, The Atelier, investigates processes and effects of nationalism and its increasingly complex relationship with capitalism, as it exists across continents and time. 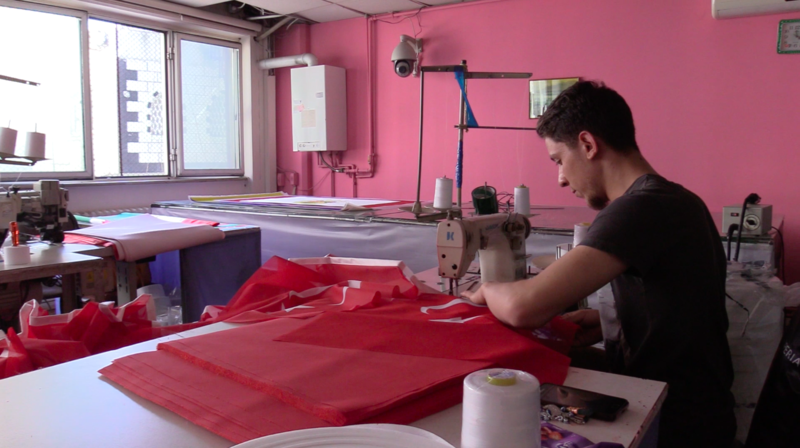 The Atelier takes the viewer to a specific Turkish flag manufacturing shop in Istanbul; where the audience is introduced to a few workers making flags amidst their employers. What starts as a tour of the technical process at a modest workshop unfolds into an age-old practice of transforming a simple piece of fabric into a sacred symbol. In this work Hasan Özgür Top takes the pulse of popular opinion by making visible this small, independent company’s foreign trade relations. A subtle yet important shift exposes economic ties with the Kurdistan Democratic Party, the Kurdish party in Iraq, even though supporting Iraqi Kurds stands against Turkish nationalist ideals. The Atelier also brings to light the use of a growing Syrian workforce. These contradictions stand as examples in Turkey where loyalty to nationhood is superseded by capitalism, which is the most recent tipping point in current social and political conditions globally.